I received product and a gift in exchange for this post, all views and opinions are my own. The Booper is now seven years old and plays in a baseball league with a pitching machine, which means I'm a full-blown baseball mom! There's nothing I love more than cheering on the boys as they learn the game and take pride in good sportsmanship. He's learning so many valuable lessons not just about the game but about life too. While I love being at the ballpark to enjoy his games, our little miss just doesn't have the attention span needed to sit still for that long. 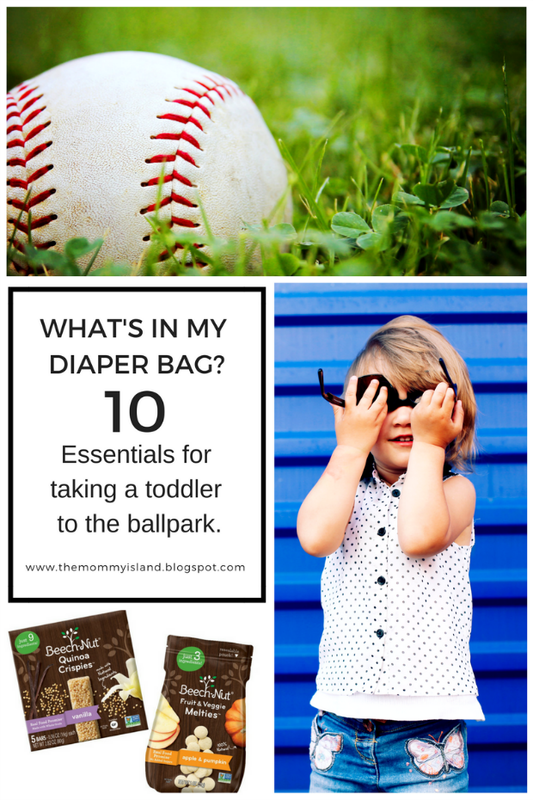 I have to come prepared and pack my diaper bag with 10 essentials that make watching his baseball games fun for her too. Of course this is the stage we're in right now. Your toddler might be in the potty training stage, so extra trainers might be needed. This is a go-to in my bag or purse at any stage. I never want to be at the ballpark when little miss has an explosion diaper and run short on wipes. Baby wipes have so many uses. Whether it's cleaning ketchup from her hands after eating a concession stand burger or wiping her grubby fingers after trying to pull an old piece of gum from the bottom of the bleachers. It is my firm belief you can never go out without wipes! It's so important when you're going to be gone from home for a long time to have a drink for your toddler. We pack her sippie cup and the Booper keeps his water bottle in his ball bag. We all try to stay hydrated for those long games in the sun. There's nothing as ferocious as a HANGRY (hungry + angry) TODDLER. Our little miss is full of sass on a regular basis, but she gets down-right mean when she needs to eat. Toddler snacks serve so many purposes though while at the ballpark. They fill her belly, but they also help me to keep her on our blanket or sitting on my lap while she eats. When grabbing a snack to throw in my bag I like to think of easy options that will keep her munching but not spoil her dinner. She LOVES the new toddler Crispies from Beech-Nut. They're an individually wrapped crunchy/chewy bar she can hold and enjoy while listening to me yell for our favorite player. 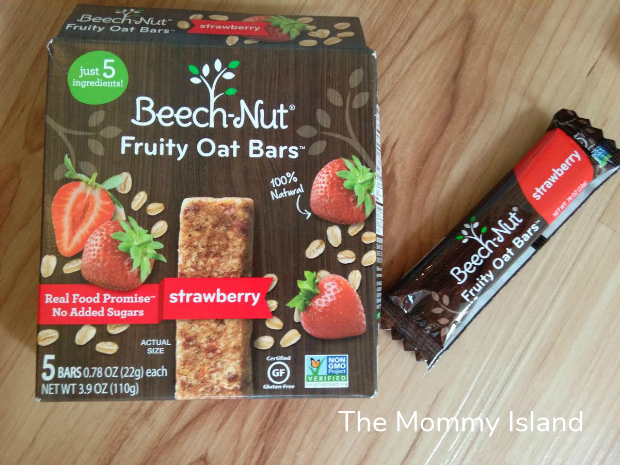 Other foods she loves for me to pack include the Cereal Puffs and for times we rush to make it to the game a Beech-Nut Pouch is the perfect meal on the go. When you're a little princess you can't walk around the ballpark as anything less than pristine cuteness. Occasionally, she has diaper leaks or spills from her cup and needs something to change into so I always pack another outfit. Depending on her outfit and the timing of the game I have to be sure my toddler's skin is protected from the harmful rays of the sun. I try to find a spot for us to sit in the shade, but packing sunblock is a must, because she rarely stays in one spot long! This is probably an obvious one for most parents, but somehow there are always moms and dads struggling to keep their toddler entertained at the field and they don't have any toys. I like to have a special toy that she only gets when we're at the ball field that way it's new and fun for her every time. I try to hold off pulling her special toy out of the bag until I know she's starting to get restless. Not only do toddlers look adorable in a hat, they help to shade their face from the sun. Win-Win! Even in the summer it's amazing how many uses you can find for a good blanket. If nothing else, it keeps her busy folding and unfolding. I don't worry about her putting it on the ground, just throw it in the wash when we get home. My favorite parenting hack is putting a blanket on the ground and telling her she can have the snack if she sits on the blanky. Most of the time it works to keep her immobile for a while then I can keep up with the game. 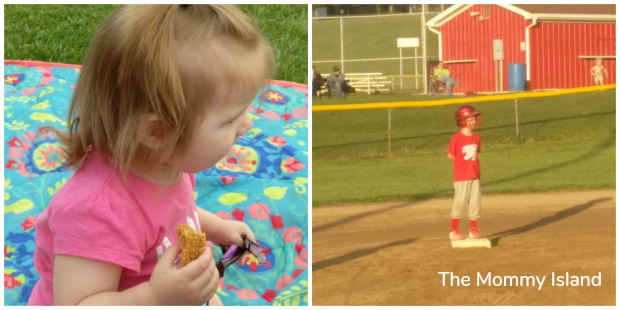 Having snacks for your toddler is great, but sometimes mom and dad need to hit up the concession stand for a drink. Keeping a few dollars stashed in the pocket of my diaper bag is my back up plan for any trip. 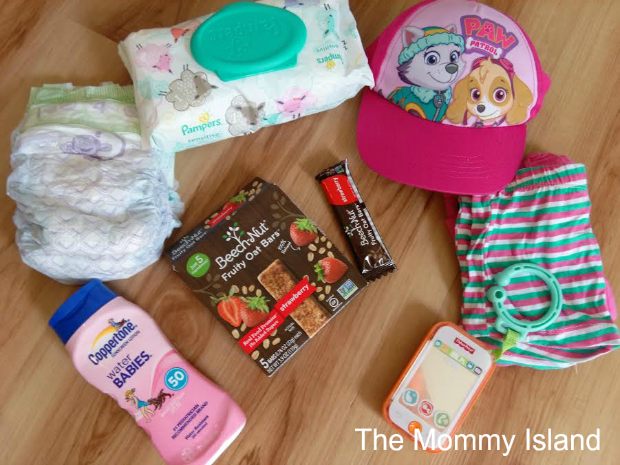 These are the toddler essentials that have to be in my diaper bag when I double-check before running out the door. What are some things you NEVER go without when packing your diaper bag? I would love to hear about your diaper bag staples in the comments below! I have also added sunglasses. They may be more foreplay than you but I have them just in case! During baseball season I have sunflower seeds and eye black in my diaper bag! You have the essentials I would want in my diaper bag. My grandkids used to love PUFFS. I liked them, because they were convenient and good. Like little flavored puffs of air. Plus I never heard of a baby or toddler choke on them! This basically sums up what I carry in mine as well! Even as my kids get older I still need a big bag every time we go anywhere! This is great! I understand the need to have all this! Thanks! Great comprehensive list. The park near us has sprinklers through the summer so have to remember a towel and swim suit as well. I always have bandaids in my diaper bag. Great round up! Helpful hints! I have a shower coming up and have the diaper bag and now am adding gifts to it! Sunglasses are a must! Another essential for me is a plastic bag (gallon size) in case we have a blowout and I don't want them to touch other stuff until I can get home and wash them! Again great choices! When you have a baby, your diaper bag is your lifeline for a happy baby! Especially if it is packed with the correct necessities & it looks like your list covers it! I always overload! I go with the saying better safe than sorry and that sometimes get me in trouble when it come to organization. I'm about to be the grandmother of twins. So between my two younger kids and grand kids on the way I really need all the tips I can get. Excellent choices. These would definitely be in my diaper bag. This is a lot like the daddy list I have made up for my hubb.When making a list for a man,MAKE SURE TO ADD BABY TO THE LIST. I can't believe how much stuff mothers have to cart around when they have kids. great list. Sunblock is a must! I'll have to purchase the Quinoa Crispies! 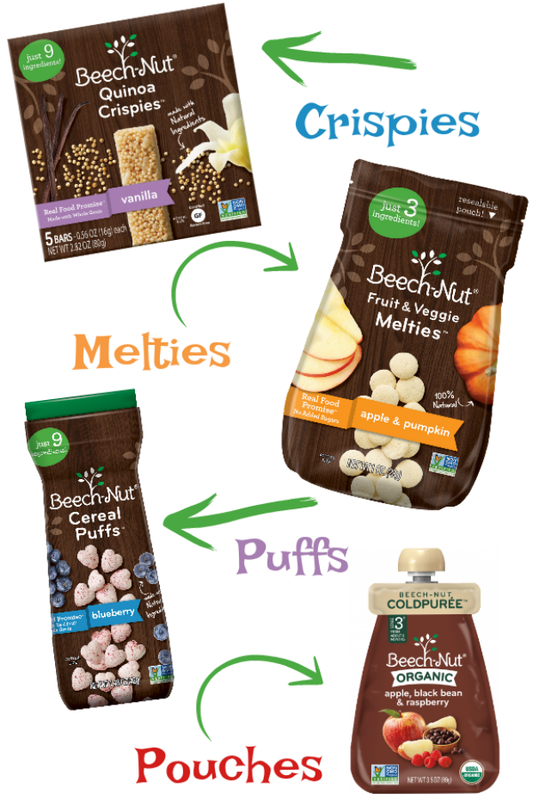 Those Beech-Nut products look like a great variety! When your child is happy then so are you and a good time can be had by all! Remember to pack a bottle of water or a couple of things for yourself too! I always over packed..you know..just in case they needed this or that! lol The puffs are awesome to carry around for anytime. Essentials and more. Yes snacks. I have 2 toddlers and an older one in sports so I completely understand. My boys don't like to sit and watch their big brother so I always have to be ready to keep them busy. Even If it's playing educational games on their leapfrog laptop. Love the suggestions and all the things you take in your diaper bag... I always had 2 diaper bags with my little ones as I never thought one was enough! Don't forget the ice pack! I would love to pack a diaper bag now with sunblock and a hat, if only the weather would warmup and we could go out! You definitely have the right idea about what goes into a diaper bag that’s for sure! If baby is happy, momma is happy!! Thank you for sharing! Protecting their lips is also a must. Dried up lips are awful too. They can split and bleed. Toddlers also like pulling off the dead skin on their lips and that will definitely make matters worse! There’s chapstick or carmex - aides like these to protect them. Just something to think about. This is a practical list. I will send it to my niece who has a toddler.